An interesting statistic that I always throw out in my Introductory Wine Appreciation class is that wine is produced in every one of the fifty United States… I can’t say that I have actually had wine from all fifty states, but I’m close. Some would call it an affliction… the fact that everywhere I go, I seem to find wineries to visit. 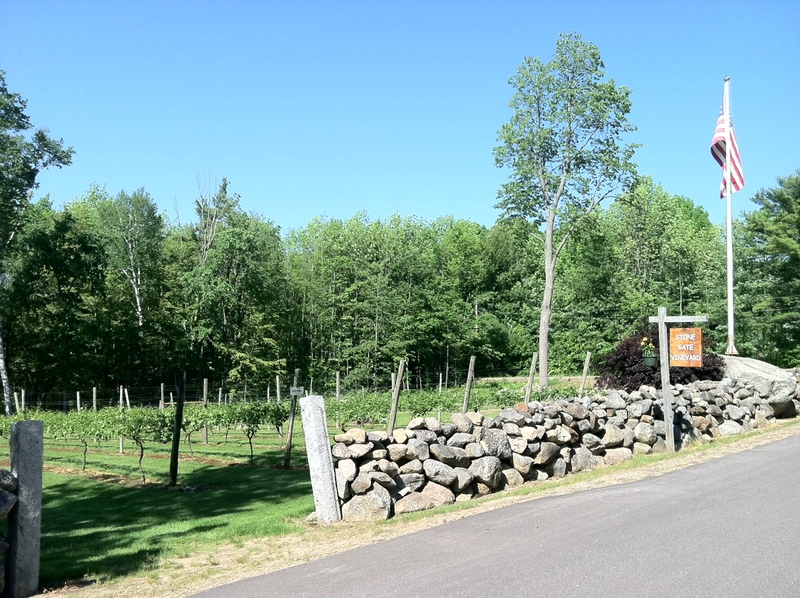 Who would have thought that on Memorial Day weekend in New Hampshire I would be tasting wine at a lovely little vineyard in the lakeside town of Gilford… next door to Laconia and Weir’s Beach. Yeah, that Laconia… And I’m happy to report that Stone Gate Vineyard (www.stonegatevineyard.com) is a real gem! Owner and winemaker Peter Ellis was open for the first day of the season when we stopped by. Engaging and passionate, Peter explained that five years ago he and his wife started Stone Gate as a second career. With a total production of around five hundred cases, Stone Gate is committed to quality versus quantity, often selling out of their wines before the end of the season. The wines are made from primarily hybrids, with a tasty, winter-hardy Riesling a notable exception. A small amount of estate grown grapes go into production, with the balance of the wines made from fresh pressed juice sourced in the Finger Lakes region. Vidal Blanc – Citrus nose, perfumed with a dry, crisp finish – nicely balanced with just a hint of residual sugar. Vignoles – Lemony with lovely bee’s wax and petrol hints – crisp and dry with a refreshing tartness. Cayuga – Fruity nose with apple and grapefruit – crisp with a pleasing sweetness. Riesling – Classic petrol nose with lemon, apple and apricot – very light with great balance and finesse. Steuben – Wild strawberry nose, fruity – clean, simple and easy drinking. Marechal Foch – Bright cherry nose with fresh herb and spice – medium-bodied with more cherry (added tannin to improve structure). Winnipesaukee Red (A blend of De Chaunac and Roujeon) – Spicy and wild with cherry notes – full-bodied with a long, pleasing finish – slight residual sugar calms the acid perfectly. Frontenac – Bright cherry nose – spicy with slight petulance (dissolved CO2) – herbaceous. The STAR CHEF DINNER SERIES comes back to Gracie’s in July – Don’t miss what promises to be a remarkable event! Gracie’s welcomes the Sinskey family back to Providence! The award-winning husband and wife team return as part of our Star Chef Series for what is sure to be a memorable evening in July. 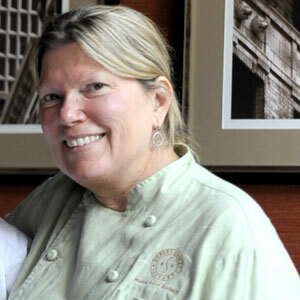 Chef Maria Helm Sinskey will be collaborating with Gracie’s Chef Matthew Varga in a very seasonally-inspired menu showcasing some of the freshest local ingredients around. The Savory Grape will be on hand teaming up with Robert Sinskey, vitner, of the family winery, as he talks to guests about the great wines made from vineyards of theirs in the Carneros and Stags Leap District of Napa, and Sonoma Valleys. I’m picky about my Pinot Noir and folks who know me, know that I gravitate towards red Burgundy… That said, I do have a soft spot for Pinot Noir coming out of the Central Coast of California, especially those that strike a balance between the effusive fruitiness of West Coast Pinot Noir and the earthy, elegance of the Cote d’Or. 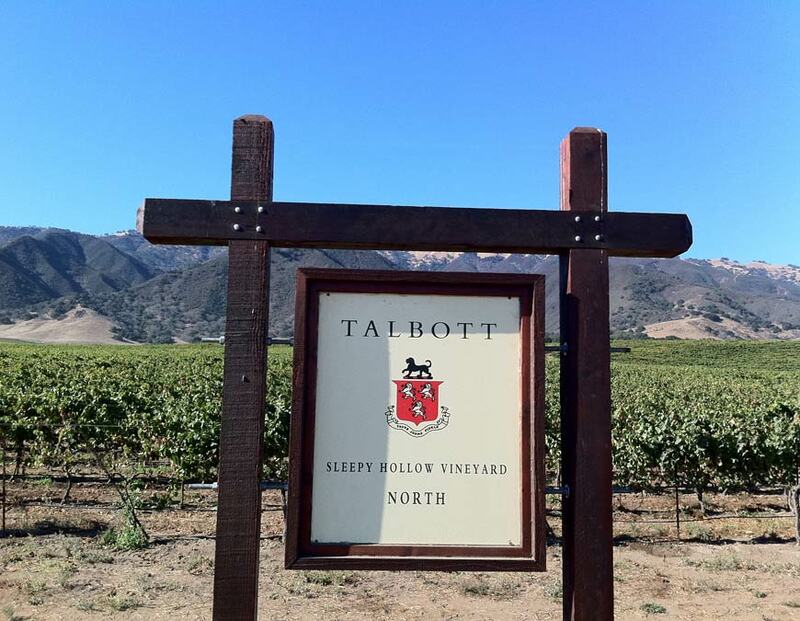 I had the 2009 Talbott at dinner recently and was quite impressed with its character and focus. So much so, that we picked up a case at a net price of $24.00 per bottle – quite the value, in my opinion. Ripe nose with vibrant red berry aromas and pretty floral hints. Medium-to-full-bodied with moderate acidity and supple tannin – well balanced. Fruity, elegant palate. Jammy with tar and roasted game notes. Long finish – smooth with lovely resolve. Drinking well now and should hold for another 3 to 5 years. Very Nice! The contest is quite popular with wines entered from all 50 states in the US, as well as 8 Canadian provinces and 8 other countries from around the globe. In all, 2012 boasted over 4,300 entrants in 50 categories. Our performance this year was excellent, with Team Musings turning in an impressive 681 wines judged in a little over 19 hours – that’s an average of one wine every 3 minutes – a brisk pace to say the least. In general the wines were good-to-pleasant with a few outstanding and few really poor entries. The majority of wines are red vinifera blends and single varietals, many from kits, but many from cultivated grapes. The most unusual offerings this year were the Piña Colada wine and a wine made from the Southeast Asian Durian fruit. The Piña Colada wine tasted, as you might imagine, like pineapple and coconut. The wine was well made and because wine judging does not involve personal bias, scored well. The Durian wine, on the other hand was an unmitigated disaster. Durian is native to Brunei, Malaysia and Indonesia and is also known as the “King of Fruits.” Durian has a very particular odor, a unique taste and is covered by a hard husk. Having a disagreeable smell, compared to skunk spray or sewage, the fruit is forbidden in hotels and public transportation in Southeast Asia. Making a wine from this fruit begs the question of why? The nose was foul, and while the palate was acceptable, the persistent skunk smell made it impossible to drink. Brings to mind an old adage… Just because you can make wine out of something, doesn’t mean you should. Overall, the experience is wonderful and our role as judges is to offer critical assessment to the entrants. While we are primarily sifting through the wines to find medalists, we are also responsible for offering encouragement to those hardy souls who took the time to make, package and ship, from often far-flung corners around the globe their creations. We take this role very seriously, for it is the enthusiasm and passion of the home winemaker and brewer that fuels a growing movement – a movement that has been a part of the US since its very beginnings in the early 17th century. I will make the same statement that I have made after each of these contests – home wine making is a ton of fun and doesn’t take much to turn out a drinkable bottle of wine. I encourage everyone to give it a try – there is nothing like popping the cork on your own bottle of wine and pouring it for friends to enjoy! The Ventoux AOC, previously known as the Côtes du Ventoux, is in the southeastern part of the Rhone Valley, on the slopes of mount Ventoux at the foot of the Vaucluse Mountains. The climate is Mediterranean with plenty of sunshine to ensure adequate ripeness of the grapes. The region has a long history of wine making, stretching back to the time of Roman occupation, around 30 AD. There are more than 1,300 vineyards in the region, producing a wide variety of grapes. The wines produced are fairly high-value, meant for early consumption. The Ventoux from Domaine Font Sarade is a blend of 60% Syrah and 40% Grenache, grown on approximately 12 acres of vineyard owned by the winery. The estate also produces Vacqueryas and Côtes du Rhone wines, for which they are fairly well known. 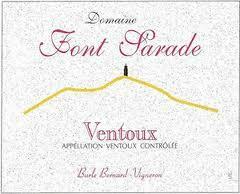 Their Ventoux is a charming wine, perfect for summer fare. At an average bottle price of $14.99 per bottle pre-discount this is a good value. Fleshy, fruity nose with black cherry, anise and dried herb hints. Medium-bodied with moderate acidity and supple tannin – good balance. Lush, dark fruit palate with tarry, rustic notes. Smooth. Moderate length – quaffable. Drinking well now – not for aging. Good value. 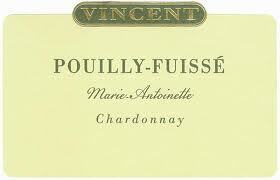 Twenty-nine years ago, Pouilly-Fuissé was all the rage. I remember going to the then “hot spots” in Boston’s fine dining scene and being literally awash in the wine. The sad part of the memory is that Pouilly-Fuissé just wasn’t that good. It was a pretender to the throne of those rarified white Burgundies from the Cote d’Or, and the American fine wine palate was anything but fully evolved, so we really didn’t know any better. The J.J. Vincent Pouilly-Fuissé Cuvèe Marie Antoinette is a tribute to Jean Jacques Vincent’s mother; Marie Antoinette Vincent. The wine is sourced from several parcels including young vines from the Chateau Fuissé vineyards of Le Clos, Les Brules and Le Combettes as well as several non-domaine yet family owned parcels throughout the appellation. Impressive pedigree and it shows – the wine is bright and expressive, with solid Burgundian terrior. A charming alternative to domestic Chardonnay, at an average retail price of $19.99 per bottle, the wine is quite a nice value. Lively nose with apple, vanilla and dried hay hints. Medium-bodied with moderate acidity – good balance. Lush palate with citrus, apricot and a judicious dash of oak. Moderate length – smooth with persistent vanilla on the aftertaste. Drinking now – not for aging. Thirty years ago producers in Chianti began a concerted effort to greatly improve the quality of their wines. The movement was anything but easy, largely due to “misguided” traditions that involved over cropping grapes to boost production and antiquated wine making techniques that did not promote quality. It is an ironic coincidence that the Italian word for the infamous straw-covered bottle is fiasco. Apropos, indeed. The good news is that all the hard work is paying dividends and Chianti has rebuilt its reputation as a fine wine region. Badia a Coltibuono is about one thousand years old but its prehistory takes us back to Estrucan times and beyond. As we know it today, Badia a Coltibuono (which means Abbey of the Good Harvest), dates from the middle of the eleventh century. In 1051 the monks of the Vallombrosan Order, a Tuscan reform of the Benedictines, founded the Abbey and also began planting the first vineyards in the Upper Chianti area. Over the centuries they extended their vast land holdings to include many thousands of acres and developed a flourishing wine production and commerce. The estate was first sold by lottery and then in 1846, Coltibuono was bought by Guido Giuntini, a Florentine banker and great grandfather of Piero Stucchi-Prinetti, the present owner. Under the guidance of Piero Stucchi Prinetti, the estate grew and built a solid reputation in Italy and abroad through the high quality of its products. Nowadays, his children Roberto, Emanuela and Paolo continue the activities embarked upon by their ancestors. I have been a great fan of Badia a Coltibuono wines for a very long time, with the recent vintages of most of their different Chianti bottling showing stellar quality. 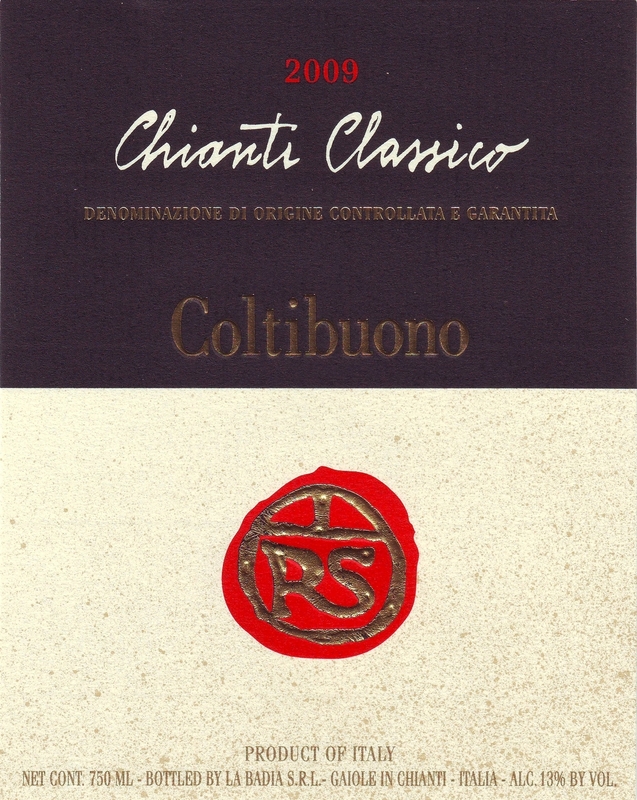 One of particular note is the 2009 Chianti Classico Selezione RS, a high-value Chianti Classico that embodies the region with its bright red fruits and balanced acidity. At an average retail price of $14.99 per bottle, the wine is quite a nice value. Rustic, earthy nose with dried cherry, saddle leather and cedar hints. Medium-bodied with moderate acidity and moderate tannin – good balance. Sour cherry and red berry notes – persistent leather and cedar on the palate. Moderate length – smooth with a touch of floral on the aftertaste – violets and lavender. Drinking well now and should continue to improve for another 2 t 3 years in the bottle. Classic Chianti Classico and a very good value from a solid producer.